Four 32-inch color monitors are positioned on low four-wheeled steel platforms. Each is attached to cables 75 feet long (23 meters) and can be moved about by the viewers as they like. All the images are recorded in a house. The artist is not looking through the camera, but is carrying the “object of seeing” with him, and putting it down here and there. All of this happens simultaneously on all four monitors. Four places, images, sites can be seen, and then suddenly they are ripped from view. In each monitor, the autofocus of the camera can be heard almost rhythmically as it searches for things to lock onto. The physical placement of the camera/object is felt. 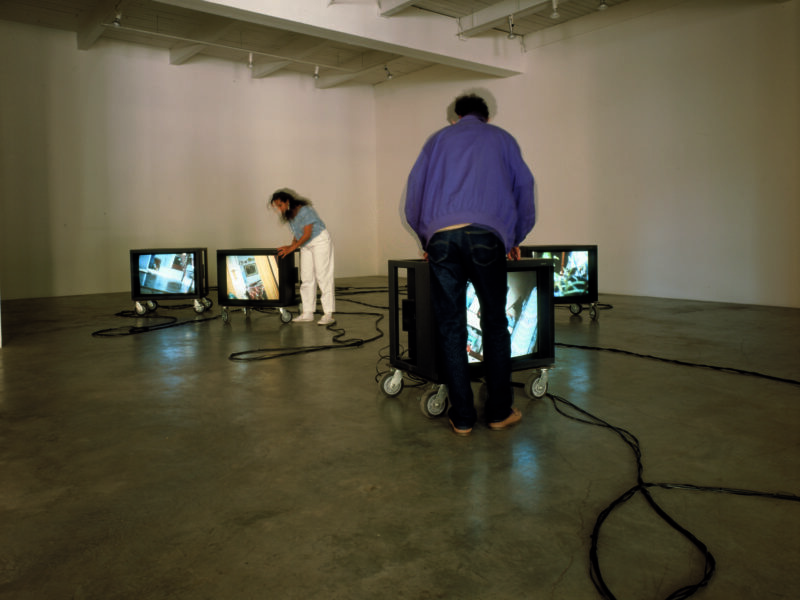 By moving the images/objects, the monitors, the viewer extends the process from the house to the space housing the work. 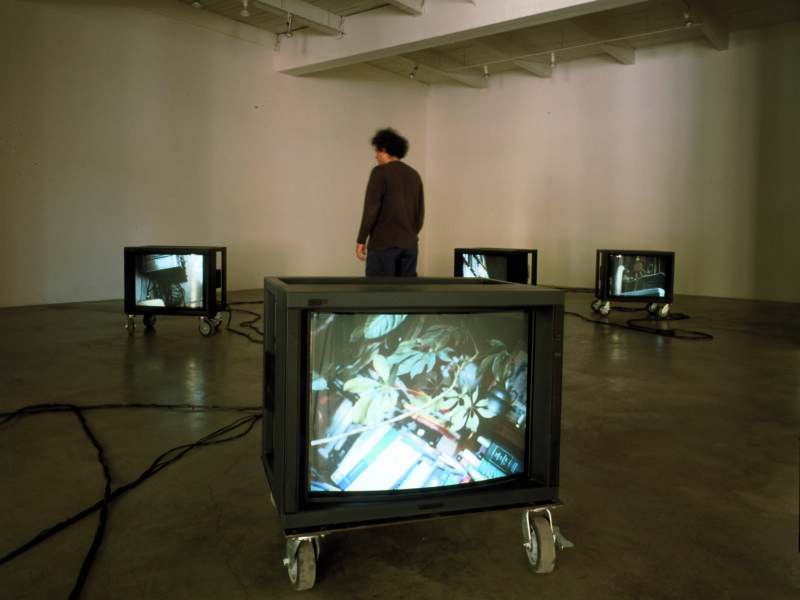 An example of this work was first exhibited at the Musée d’art contemporain de Lyon as part of the exhibition, “3e Biennale d’art contemporain de Lyon,” December 20, 1995 – February 18, 1996. 14th World Wide Video Festival, Kijkhuis, The Hague, The Netherlands, April 26 – June 2, 1996. Solo exhibition. 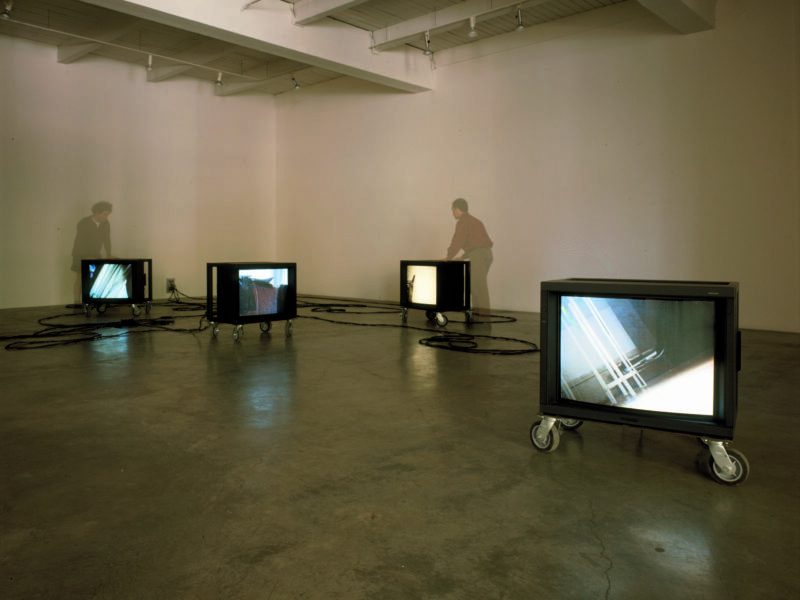 Donald Young Gallery, Seattle, Washington, May 2 – June 22, 1996. “De Rode Poort/The Red Gate,” Museum Van Hedendaagse Kunst Gent, Ghent, Belgium, November 9, 1996 – February 2, 1997. 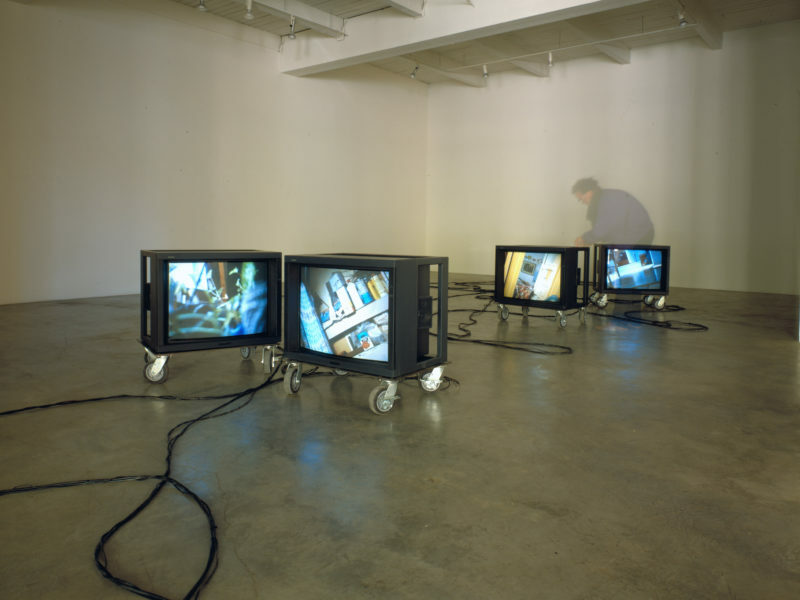 School of the Museum of Fine Arts, Boston, Massachusetts, January 19 – February 21, 1999. 3e biennale d’art cotemporain de lyon: installation, cinéma, vidéo, informatique. Paris: Réunion des musées nationaux, Biennale d’art contemporain, Paris, 1995, pp. 22, 522. De Rode Poort. Ghent: Museum Van Hedendaagse Kunst, 1996, pp. 78, 79. 14th World Wide Video Festival. Program notes. The Hague: World Wide Video Festival, 1996, unpaginated. Lestocart, Louis-José. “Gary Hill: Surfer sur le medium / Surfing the Medium.” art press 210 (February 1996), pp. 26, 27. Suchère, Eric. “Gary Hill Le Trafiquant d’ Images.” Beaux Arts 142 (February 1996), p. 70. Fredericksen, Eric. “Gary Hill at Donald Young. Where am I?” The Stranger, Seattle 5, 34 (May 15, 1996). Amalfitano, Lelia. Gary Hill: Placing Sense Ö Sens Placé. Boston: School of the Museum of Fine Arts, 1999, unpaginated. Morgan, Robert C., ed. Gary Hill. Baltimore: PAJ Books / The Johns Hopkins University Press, 2000, pp. 239. Quasha, George and Charles Stein. La performance elle-même in Gary Hill: Around & About: A Performative View. Paris: Éditions du Regard, 2001, p. 11. Gary Hill: Selected Works and catalogue raisonné. (Wolfsburg: Kunstmuseum Wolfsburg, 2002), pp. 194. Quasha, George and Charles Stein. An Art of Limina: Gary Hill’s Works and Writings. Barcelona: Ediciones Polígrafa, 2009, pp. 36, 37, 588.